Did you know a series of unique interactions make up the overall customer experience? And that one single negative interaction in the customer journey can adversely impact the whole experience? Organizations that want to provide customer experiences devoid of negative interactions, but increase revenue, customer loyalty and retention while lowering cost, need to embrace service design. Internal IT departments have a two-fold reason to embrace service design – they deliver products and perform a service. Service design is the “planning and organizing of people, infrastructure, communication and material components of a service in order to improve its quality and the interaction between service provider and customers”1. Who are the various users and what are their motivations and goals? 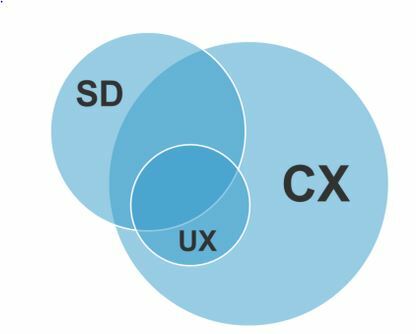 You have probably heard of customer experience design (CX) but how does CX differ from service design? Unlike CX and UX (user experience), service design also covers “the behind-the-scenes activities that enable those experiences to be delivered as planned”1. See diagram below, more on this here. Product and service components – what is and should be delivered? Information, education, warranties, results, contracts, tools, goods, etc. Data – What data needs to be captured, stored and delivered before, during and after the touch points? How do we incorporate service design? Service design makes the experiences an organization delivers “useful, usable, efficient, effective and desirable”. As a department, internal IT teams provide technology that delivers services. At the same time, they are delivering a service by developing the software. In this case, these teams are a bit unique compared to software development companies. So they need to incorporate service design on two levels: 1) in how they deliver the project and 2) in how well the product delivers a service (product design). Service design thinking can be incorporated into every role and every phase of a project, centered and coordinated around a hub of expertise and tools. 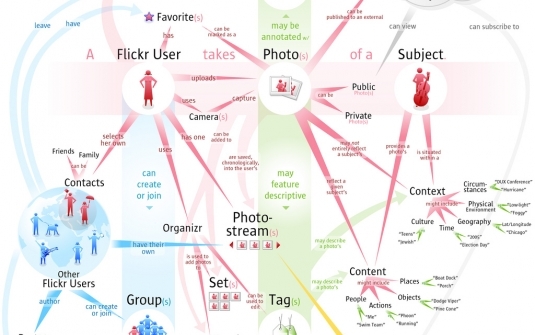 So you want to get into social media? Get holistic. When it Comes to Social Media, Is Your Company Like an Overprotective Mom?